LOCATION.--Lat 43°44'48.5", long 75°20'00.4" referenced to North American Datum of 1983, Lewis County, NY, Hydrologic Unit 04150101, on right bank at downstream side of bridge on Donnattsburg Road at Donnattsburg, 1.2 mi downstream from Chase Lake Outlet, 4.2 mi northeast of Glenfield, and 5.0 mi upstream from mouth. PERIOD OF RECORD.--July 1942 to current year. REVISIONS HISTORY.--WDR NY-87-1: Drainage area. GAGE.--Water-stage recorder and crest-stage gage. 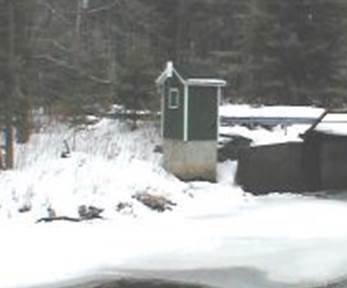 Datum of gage is 972.84 ft above NGVD of 1929 and 972.53 ft above NAVD of 1988 (VERTCON). Prior to Sept. 16, 1949, nonrecording gage at same site and datum. REMARKS.--Water Years 2014-18: Records good except those for estimated daily discharges, which are poor. EXTREMES FOR PERIOD OF RECORD.--Maximum discharge, 9,420 ft³/s, Dec. 30, 1984, gage height, 13.34 ft, from rating curve extended above 3,200 ft³/s on basis of slope-area measurement of peak flow; minimum discharge, 15 ft³/s, July 23, 2018; minimum gage height, 2.85 ft, Sept. 17, 1948, Aug. 4, 5, 1949.